Cupolas have been flagpoling malt distilleries since Charles Doig first designed them for Dailuaine in the mid-nineteenth century. They shoved out old, English “cardinal’s hats”; ventilating kiln-choked buildings with a little more élan; anglophile clunkiness making way for Arabian finesse. The block capitals had an even lower-grade job. They distinguished a distillery to a ship making deliveries through the murk and fog of the east Atlantic. Thick, black, person-high letters could be squinted for amidst the pea soup. Simple stuff. Neither of these functions, of course, apply any more. It’s a rarefied distillery that still does its own kilning, and ventilation systems have come a long way since Charles Doig. These days barley only comes across on ships insofar as they ferry the haulage lorries over the Hebridean. CalMac are hardly docking at Lagavulin. And yet they remain the blueprints for so many new distilleries in a triumph of form over function. It’s architecture school-uniform-style. Brick and mortar humped into golf club blazers and Masonic rings for affectatious respectability in the visitor centre era. Don’t get me wrong – it’s pretty affectation. But it smacks of putting more thought into what goes onto the customer’s Instagram feed than into their nosing glass. Factories gussied up into theme parks, with a teaspoon of oleaginous nostalgia to help the in-the-meantime gin, artisan soaps and craft keyrings go down. And of course, so identikit and predictable are some of these distilleries that it’s almost as though they’ve been assembled by mail-order Ikea flatpack. Safe, clean, well-trodden. Two roads diverge in a constructural wood, and both are worn really about the same. 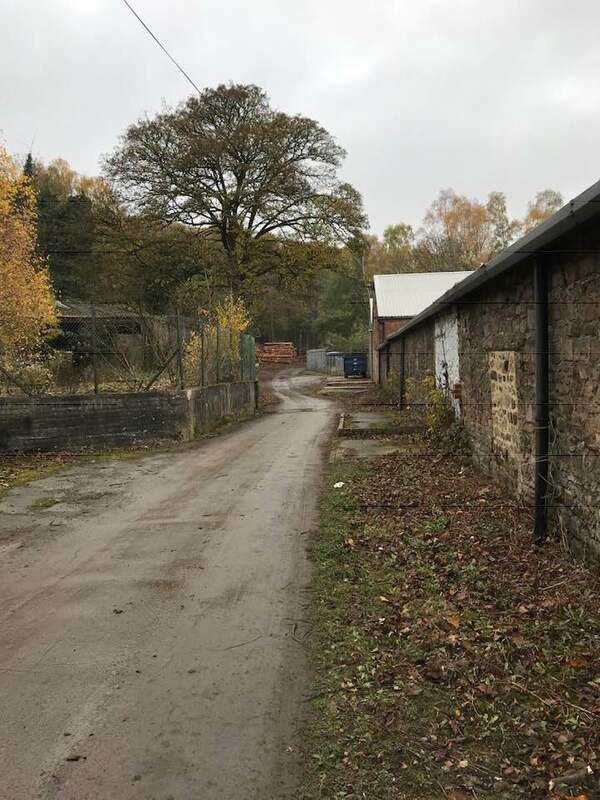 So it was something of a pleasure to spin off the A6 onto a Victorian industrial estate on the banks of Derbyshire’s River Derwent. Which I absolutely guarantee wasn’t what you thought of when I asked you to picture a distillery. This is where World Heritage Site meets tetanus minefield. Piles of autumnal leaves the colour of rust mingle and tessellate with piles of rust the colour of autumnal leaves. Here are the drawn battle lines of urban and rural; of agriculture and industry; of Lord Byron and D.H.Lawrence; of north and south. The Derwent quietly gurgles through; the grey air hangs dank and heavy, and the buildings have a gutted, carcass feel. A slender path bends up the ridge and into the rustling woods. It could lead to Mellors and Constance Chatterley as easily as it could to that scene from Deliverance. In fact it leads to a reservoir and an embarrassment of grey squirrels. Graffiti on a burned-out, boarded-up doorway snarls “snake or die”. One doesn’t like to speculate. 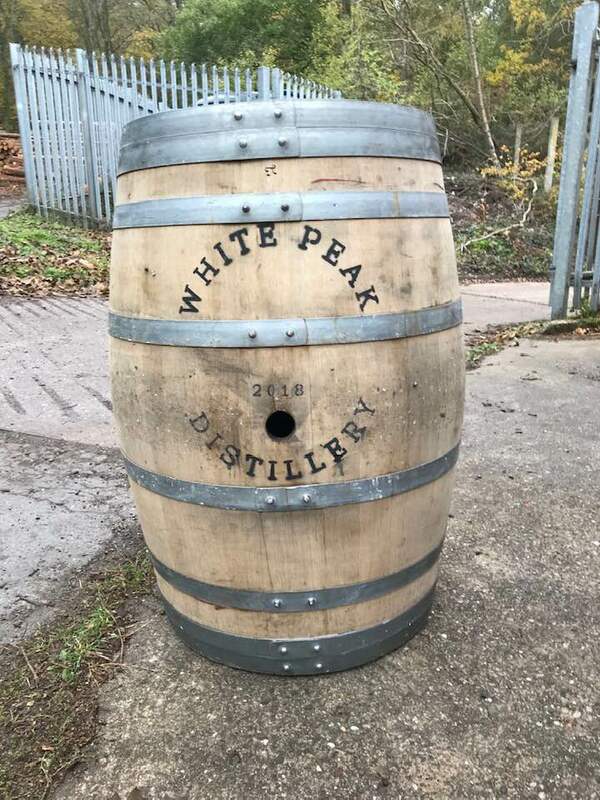 On a lone barrel, marooned by a corner: “White Peak Distillery”. There are – count them – over twenty distilleries whipping up whisky-in-waiting across England and Wales. You can see the majority on the WSTA’s recent, mildly ballsy, English and Welsh Whisky Trail. White Peak isn’t a WSTA member, so it didn’t make the cut. But it’s there, holding the middle of that vast space in the Midlands, like a spider holding court in a web. And, trail or not, you should pay it a visit. Because what they’re doing at White Peak is worthwhile, charming and impressive. I visited with Mark. It’s his fiefdom, after all. I nearly said “his manor”, but actually Newton Manor is twenty minutes down the road. He’s been here twice before, and as we wait outside the buildings, he points to a tiny, windowless cube of concrete just across the driveway. “Crikey.” It looks like the torture cell in a gulag camp. A minute or two later, Max bowls up in a branded Land Rover. He’s the distillery’s founder and owner. He’s just been out making a couple of deliveries. That’s the sort of place that White Peak is. The décor in the reception is sparing, without being Spartan. Frugal, but thought-out. Exposed brickwork, the little black dress of twenty-first century interiors, and a long rough-wooden table with stools. It feels a little like a country house kitchen. That isn’t far off being the case. A fire beams behind scorched glass at the back of the room. “You need to get some glass cleaner on that,” observes my fastidious editor. It had taken him about two seconds to clock my car’s scuffed wheel arch too. Before it was a distillery, this building was a wire works. Telegraph, telephone, barbed, you name it. Every wire but the HBO series. The cables that crossed the channel for post-D-Day communications began life here. And then, presumably somewhere around the dawn of broadband, the factory closed its doors and the rats and moths moved in. Max stumbled across it a few years ago, and earlier this year the first new make dripped through the spirit safe. Naturally, they also make a gin. But what they can do, they are doing well. Fermentations are long; three to four days at present, and due to all be four days in the future. They use two strains of yeast, a strain of dry distiller’s, and a strain of wet brewer’s yeast from a local brewery. The Denisovich interrogation cube is now their R&D lab; as useful for testing yeast strains and botanical blends in as it presumably would be for breaking fingers and pulling teeth. The stills are from the same place that made the Lakes’. They’re still in their nappy years; you can see the handprints on the copper where they were fixed into place. But they look used, worn, battle-hardened. Turns out that polishing them to the high shine you see at so many distilleries is a two or three grand job. “And I quite like them as they are,” says distiller Shaun. “They sort of look right for the place.” I agree. They sort of do. Shaun is something of a coup for White Peak. 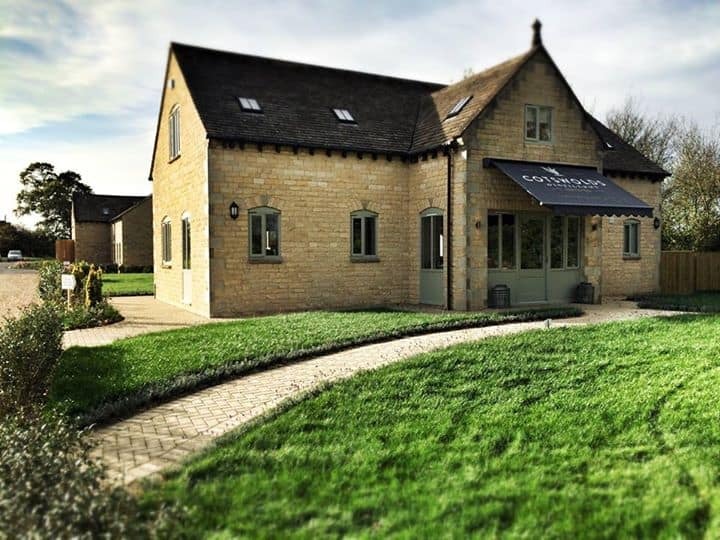 He’s a former brewer who earned his distilling stripes at no less a place than Cotswolds. 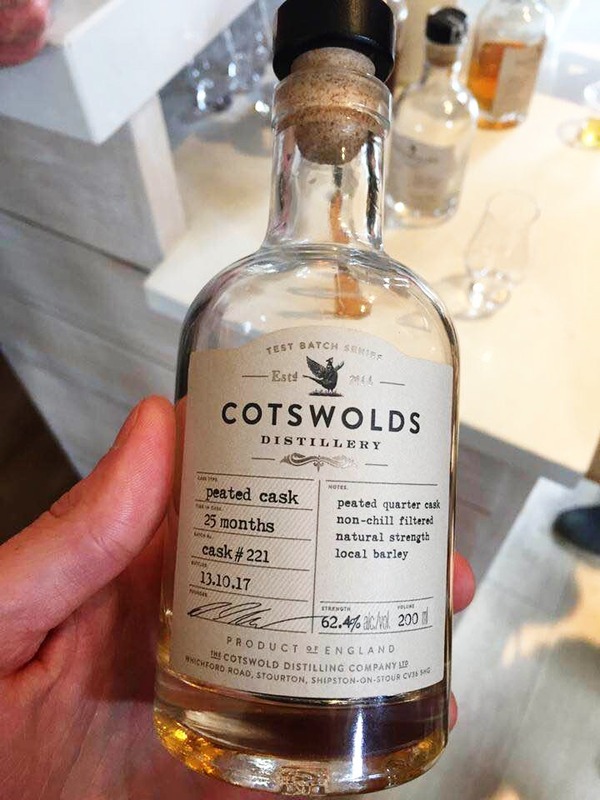 And much of what he learned at Cotswolds – clear worts for fruitier wash, long fermentations, short foreshots and shaved, toasted and recharred (STR) casks – has been transplanted into White Peak. But this isn’t a carbon copy. Shaun prefers his whisky with a bit of peat, so that’s how White Peak make theirs. Five parts unpeated barley to one part peated to 50ppm. Even the STR casks are being tinkered with. 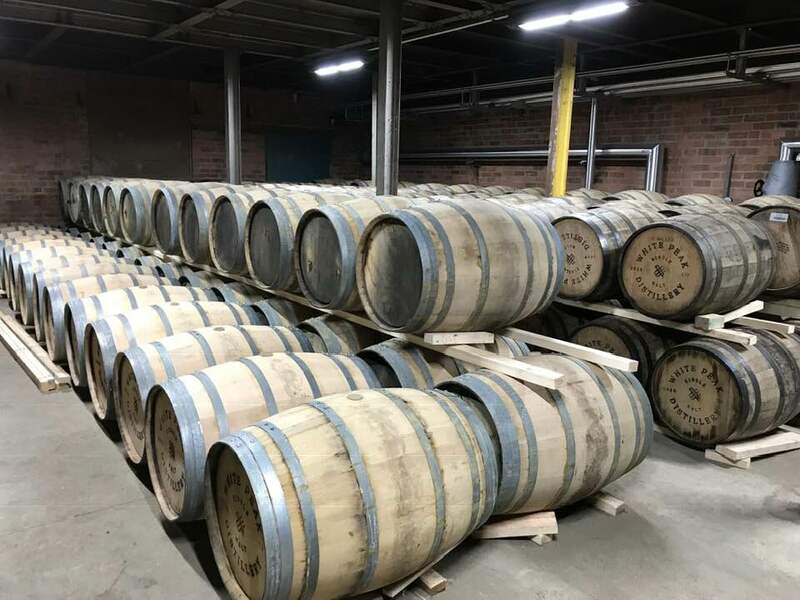 They’re American oak caks from Portuguese distilleries, but Shaun and Max are playing around with virgin French oak cask heads, to add a fresh dimension. The majority of casks, of course, are ex-bourbon. Heaven Hill, since you didn’t ask. At the moment they’re filling a cask a day. Which, it occurs to me, is the same as Penderyn, when they started out in South Wales. The maturing spirit is tucked beneath the distilling apparatus at the moment; hidden in a small, surprisingly cool enclave. It looks as though they’ll soon be out of space. But then Max opens a door, and 50,000 feet of former wire works gawps out ahead of us, festooned with dust and metal pipe and planks and cardboard detritus. And, weirdly, a vintage car in a plastic bubble. It isn’t a done deal yet. There’s still some wrangling with the landlord to do. But it’d certainly keep them going for a good while. And then it’s back to the kitchenesque tasting room, for sneak preview samples and general chatter. Mark’s off to Ireland again in a week or two, and both Shaun and Max are curious to hear about the Waterford project. Meanwhile we’re learning about the upcoming plans for White Peak; expansion and development; as we sip the maturing spirit. The big hurdle is expanding beyond Derbyshire. “It’s alright when you’re the local distillery,” says Max. “People buy into that. But when you get out of your county it’s much more competitive”. White Peak haven’t been offering tours long; last time Mark visited there wasn’t even a sign on the road. And they can’t show too many people round without being taken away from the important work – actually making their product. They’re at the nub of their fledgling stage; right now there are so many plates in the air, and by my lights their focus is exactly where it should be. But amidst all that focus, something stood out, and has been my abiding memory since. 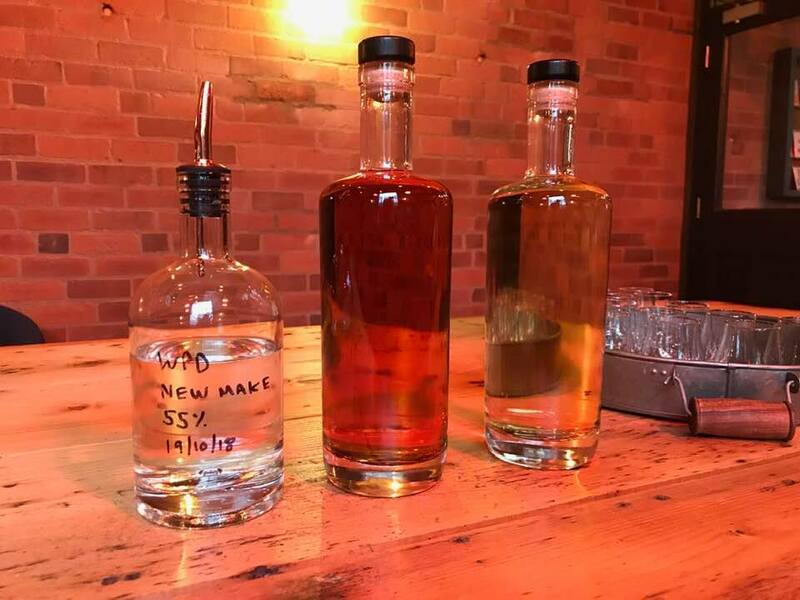 Like so many new distilleries – the Lakes, for one– White Peak offer a founder’s club. Something to generate cash early. You pay a sum upfront, and you’re drip-fed bottles over the first years. Amongst other incentives, fully-fledged members of Max’s “Temperance League” get their name on the distillery wall. That’s a common theme to these sorts of things, too. 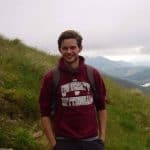 But where most distilleries lump all the names onto a one-size-fits-all board, Max has had his members’ names inscribed onto individual plaques, and is putting them up himself. Far more impressively, he could tell me about the people behind them. “He’s local” … “she’s from London” … “they’re from Newcastle”. None of this makes a difference to the whisky itself, of course. Except that it tells you it’s made by someone who gives a damn. Which tends, in my experience, to make all the difference in the world. There’s so much to do. Max, Shaun and the team are starting to get to grips with their spirit; the shape they want it to take; the way they want it presented. It won’t be whisky for another thirty months yet at least; thirty months of fiddling and furtling and decisions and trial and error and sweat and no doubt tears. The end result, of course, won’t look, smell or taste at all like the six-month-old spirit that they kindly gave us samples of to take away. And, as yet, there are no plans to bottle the not-yet-whisky as a work-in-progress series. So these notes are purely academic. And for that reason I’ve not scored them. But here are my thoughts nonetheless. On the nose: Very young. New make with the harshest edges shaved off really. But that lets the spirit’s impressive fruitiness swagger. Green apples, ripe lemons. Bananacake. The malt beneath is firm, without being too barnyard. Very mineral. Wool and wet granite. The lightest brush of smoke. In the mouth: More malt and smoke immediately. Denser. More serious. Biscuit and brine. Still spirity and piquant, naturally. Peardrop and Granny Smith rind. Flutter of vanilla. Finishes with a deeper smoke – husk-blasted – behind the juicy esthers. It’s rather visceral, bracing fare. Colour: Ridiculous for the age. Bronze. On the nose: This is six months? Really?! Well, yes, I guess so. There’s still the sharpness of peardrop. Of alcohol unsanded by time. Of high-toned esters. But they’re buried beneath honey and toffee and ginger and peppery lignin. Actually, this is very spicy, feisty fare. Orange zest and clove. Plum skins and red berries. In the mouth: Palate is developed and unctuous. Vanilla sponge slathered in honey and orange syrup, studded with clove and black peppercorn and red berry. Lightly botanical. Char and spectral smoke slither through the whole thing. This is cracking. A little sawn wood and milk chocolate. Finishes to ester and the lanolin that whispers of light peating. It’s good spirit. And it’s different to the spirit maturing in other English warehouses. These guys have a plan, and they clearly know what they’re doing. Despite the boom time carnival that single malt whisky is enjoying, life for small, craft distilleries, particularly outside Scotland, is distinctly not easy. It will be hard for White Peak to make serious waves outside Derbyshire. 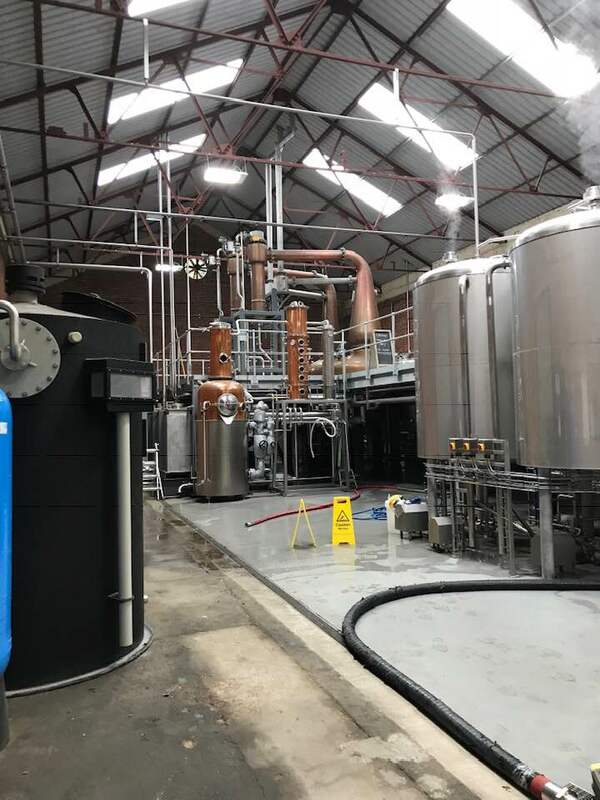 A tiny production distillery grinding away in a wound-down wire works in the dark heart of the English midlands? You bet it’ll be hard. 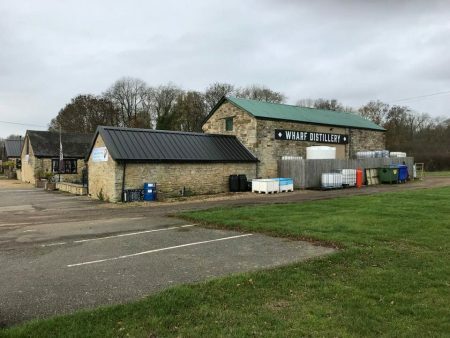 But it occurred to me, as I trundled my way south, down the grim tarmac tagliatelle of British motorway, that making whisky has always been hard for the small, have-a-go, just-cos distillers. More than the massively-funded, white-walled tourist traps, capped with their bibelot cupolas, White Peak are the heirs to neck-or-nothing men and women in pre-Excise Act glens. To immigrant Scots-Irish in unknown Kentucky cornfields. Today’s storage units are history’s covered caves. Whisky is a topsy-tursy saga of upset odds and defied risks. And at least you’re unlikely to be shot by a gauger in modern Derbyshire. If you want to play holiday top trumps with your friends, or you’re looking for a social media responses boost, I can think of better places to visit. You won’t find frills at White Peak – just look at their website. But you will find a distillery whose first, second and third thoughts go to their whisky. The sort of distillery I get a kick out of. The sort I reckon most of you get a kick out of too. Thanks so much to Max and Shaun for taking the time to show two snooty keyboard-crunchers around on a random Tuesday morning.